Running with a box of pins for his mother, Mickey trips and spills them all over the floor. Picking them up is slow-going until his father gives him a magnet. After finishing, he experiments on other household items, discovering what his magnet will and will not attract. Willie is a young boy of perhaps 4 -- he seems older than Harold but younger than Barnaby -- who regards his world thoughtfully and with a willingness to experiment. When deciding what to put in his pockets, he tries many items (including his pet and a mosquito) before deciding on the right ones; when told to follow his nose to get himself to his grandmother's, he does, always comparing his experience with what he expects. He spends a lot of time on his own, without adults around: no one is home when his pet arrives, and he journeys to his Grandmama's all by himself. Although shown seated here, Grandmama is an active presence in the stories. When she sends the pet in "Willie's Animal," Johnson illustrates her hammering the wooden box together. And her invitation to Willie prompts his walk in "Willie's Walk." Her confidence in Willie's ability to find his way to her house seems matched by -- and may help inspire -- the youngster's independent spirit. Willie's mother appears to work part-time during the day: she is not home when the box arrives, but she does come home before Willie's father. Like Willie's Grandmama, she's good with tools. At left, she is making a fence for Willie's animal. Appearing only in the story "Willie's Pockets," Willie's dad goes to work in the morning and comes home in the evening (Johnson draws him entering through the front door, briefcase in hand). Willie consults him about the uses of pockets, and, at the story's end, his dad teaches him to whistle (shown in the picture at right). 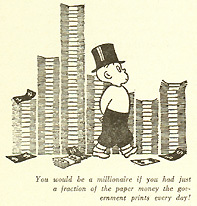 The boy at left is the "you" who appears throughout the book; the caption reads, "You would be a millionaire if you had just a fraction of the paper money the government prints every day!" 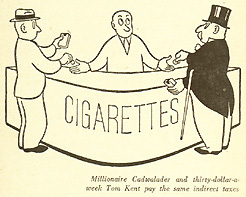 The caption at right says, "Millionaire Cadwalader and thirty-dollar-a-week Tom Kent pay the same indirect taxes." Ann would rather "have stayed at the cottage, and read a story," but Ben says, "It's more fun to do something yourself, instead of reading about it." As boundaries between fiction and the real world blur, both of their initial claims dissolve and they enjoy a "real" adventure as exciting as any fairy tale. Although his whole family says that the carrot seed he's planted "won't come up," the little boy knows it will. His father, incidentally, looks exactly like Barnaby's father. Some children demonstrate "How to learn acting"
Like Is This You? (1955), this book lacks a central character or characters and, instead, shows children playing the whimsical, inventive and -- sometimes -- slightly mischevious games that children play. To learn acting (pictured at left), "You watch people. You watch them carefully. If they walk in a certain way, you should walk that way too. If you have an Acting Club, you could all practice together." And, to make an earthquake, "you sit in some sand, like a sandpile on the beach" and "pile it [the sand] around your knees and as high as you want, and you have a hill. Then put a stone or a shell on top -- that's the house -- and wiggle your toes, and you can see the sand over your toes wiggling." After you "wiggle some more, and your whole feet, and the earth starts to crack," well, "that's an earthquake." Shown here just after hatching, the bird (who spends much of the book "a happy egg") soon finds that he can walk, sing, and fly. "Is this where you go to school?" asks the caption to this illustration. This little girl is one of many children in improbable situations. The implicit answer to this and the other questions in the book is that, no, this is not the reader. Indeed, all the children in the book refer to the child reading it and quite clearly are doing things that the child-reader probably does not do (or, at least, things that he or she isn't supposed to do). "Page five -- draw where you go to school." 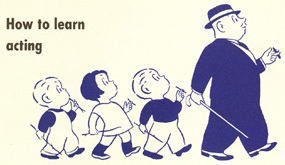 The recurring stick-figure child tells the reader how to assemble his or her book. He appears after each series of repeated questions, giving you a chance to answer in your own book. *These links primarily concern her work with Crockett Johnson. The illustration from Castles in the Sand is © 1965 by Betty Fraser, and the text of other authors' work is © by them.